John Haberle was a 19th-century American painter in the trompe l'oeil style. His still lifes of ordinary objects are painted in such a way that the painting can be mistaken for the objects themselves. He is considered one of the three major figures—together with William Harnett and John F. Peto—practicing this form of still life painting in the United States in the last quarter of the 19th century. Haberle's style is characterized by a meticulous rendering of two-dimensional objects. He is especially noted for his depictions of paper objects, including currency. 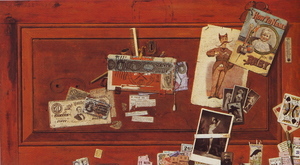 A Bachelor's Drawer (1890–94) is typical of his approach: various papers, including currency, postage stamps, photos, playing cards, tickets, and newspaper clippings, are shown affixed to an essentially planar surface. Other objects—eyeglasses, a comb, a pipe, matches, and so on—are shallow enough in volume so as not to spoil the illusion.